Not many casinos can compete with the Ruby Fortune Casino when it comes to the ambience of gaming and payout rate which is why the casino gets lots of patronage from players of different ages and nationality. 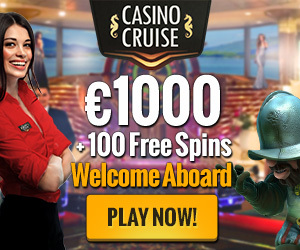 The fact that this casino leverages the reliable Microgaming software also places it at par with top favorites like Ladbrokes Casino and even Bwin Casino. Another wonderful thing about this casino is that it still had the lofty reputation that it had when I first read a review of it half a decade ago. To be sincere though, it is important to note that the regulations guarding payouts and flushing have been tightened over the years and even though the customer service has continued to improve, Withdrawals is still a serious source of headache to many members. Any player that tries to withdraw beyond five times of their life time deposit gets restricted to not more than 4000$ weekly. Furthermore, many people have complained at one time or the other about the restrictions concerning deposits and payouts but I still believe that at play through rate, Ruby Fortune Casino is still in the front burner of the online gaming industry. Another issue that players have raise is that even when the playthrough rate is achieved, players can never withdraw any more than 6x of their total deposit bonus but even at this, the money is just stored in the player’s virtual account and with perseverance, all can be withdrawn. Away from the cash out issue, the powerful Microgaming software is use by the casino is awesome even without the live casino option. Then again, even if they had one, they would have a hard time surviving against some of the other casinos who have mastered the live casino art. 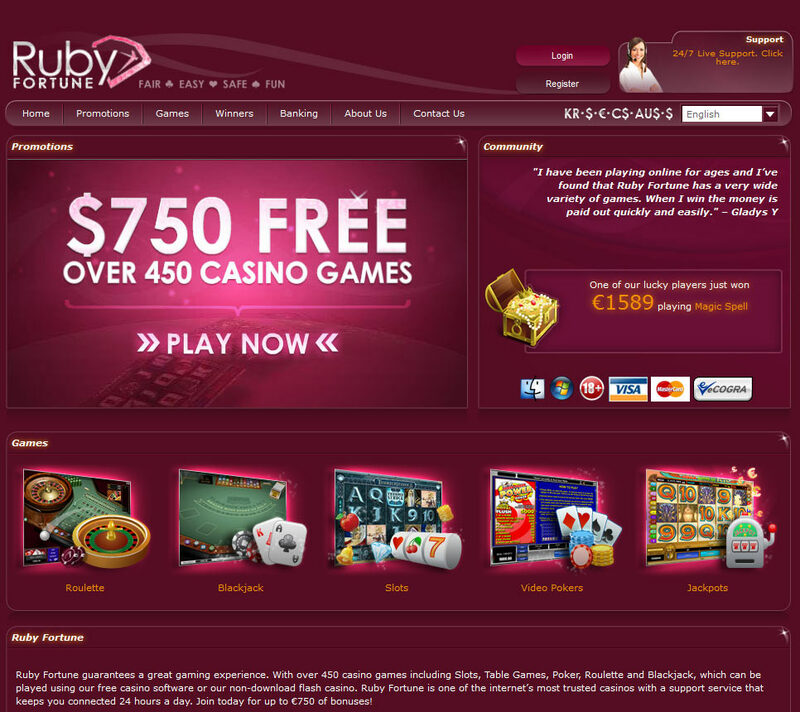 So sometimes, it is good that Ruby Fortune Casino has concentrated on the part of the casino where they excel. There is also an option where auto-play and auto-hold capability can be used to manipulate some of the games including but not limited to video poker variants and slots. This option known as the Expert Mode has helped several players who have been regular at Ruby Fortune thereby garnering experience. Not only that, the mode has also been of immense help to new players who don’t know their onions yet and because the strategy is the same across any casino using the Microgaming software, so once you learn the ropes at Ruby Fortune, you are good to go anywhere. The casino is very broad with their game selection and they have an array that includes Blackjack, video poker across all its variants including Joker Poker and Deuces Wild. As with the bumper jackpots associated with Microgaming, players who play progressive slots like Thunderstruck and Tomb Raider amongst others can win up to 7 figures. While you enjoy the games on offer, it is important to have customer support within reach which is why Ruby Fortune isn’t leaving any stone unturned when it comes with providing customer support. As per industry standard, the reverse withdrawal at Ruby Fortune Casino is not quicker than 48 hours even though they should be looking at improving because few casinos have been known to effect withdraw reversal to less than 4 hours after the demand was initiated. Ruby Fortune is also at the fore front when it comes to loyalty and VIP programs and once you become a member, it is possible to enjoy up to 0.1% on all wagers. As you soar in the VIP level more mouth-watering bonuses accrue to such members. Also when compared to many of the casinos around, the bonuses at the casino is a class ahead and the payout is also a day earlier. 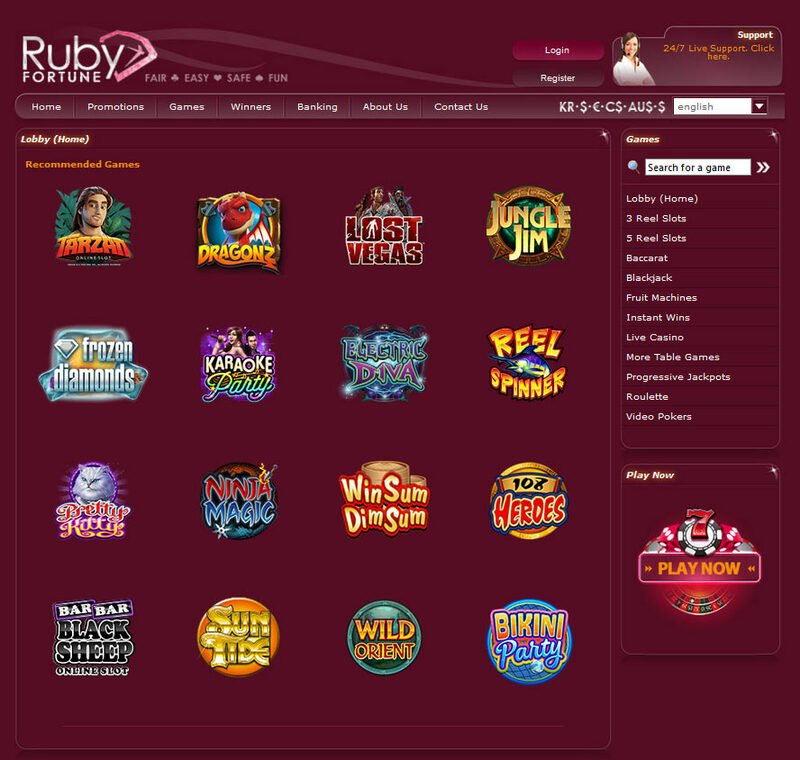 Payment methods at Ruby Fortune Casino could not be easier with the wide range of payment options available to players. Although because of the strict rules, earnings can only be withdrawn to debit cards and not credit cards. However, to cushion the effect on members, the management of Ruby Fortune Casino is currently working on the BACS equivalent, ACH payment processing so that members can enjoy better transactions. Now, if Ruby Fortune Casino is to be assessed based on the number and types of games available and then bonus offers then it still comes ahead despite the stiff competition in the industry. However, in other sections, the casino may not fare that well but then, all that the casino needs to do is to continue to improve on its offers just like it came up with a mobile version of its casino to level up with industry leaders. 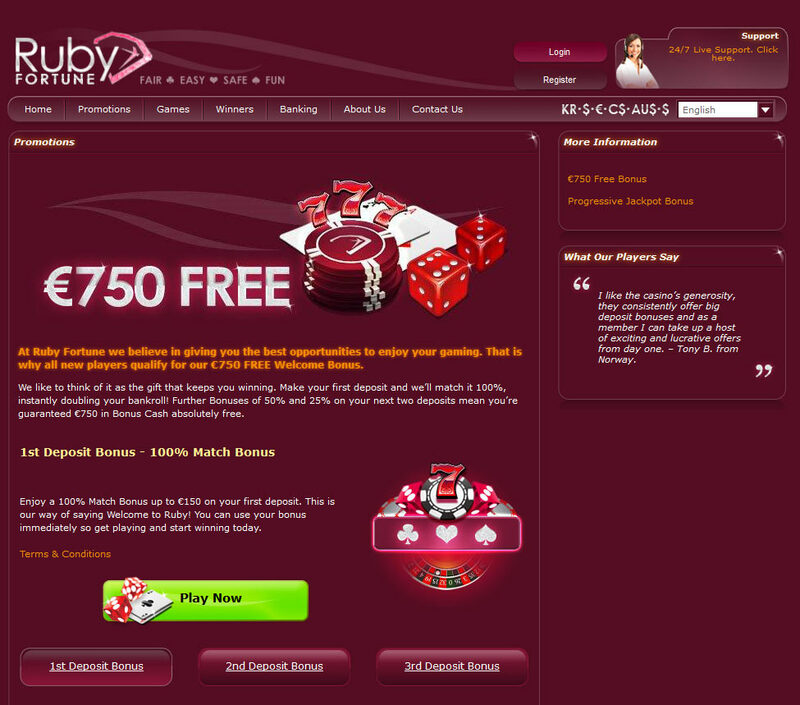 Finally, when you play at Ruby Fortune Casino, you get a double fancy of some of the latest trends in the online gaming industry which includes but is not limited to crisp graphics, sound and sophisticated animation technology so trying to sift through the over 450 games in the casino becomes easier to attempt. The betting range is also tailored to suit your pocket whether you prefer high rollers or you are cool with budget bets.